Think “modern design” and “barn” doesn’t immediately spring to mind. 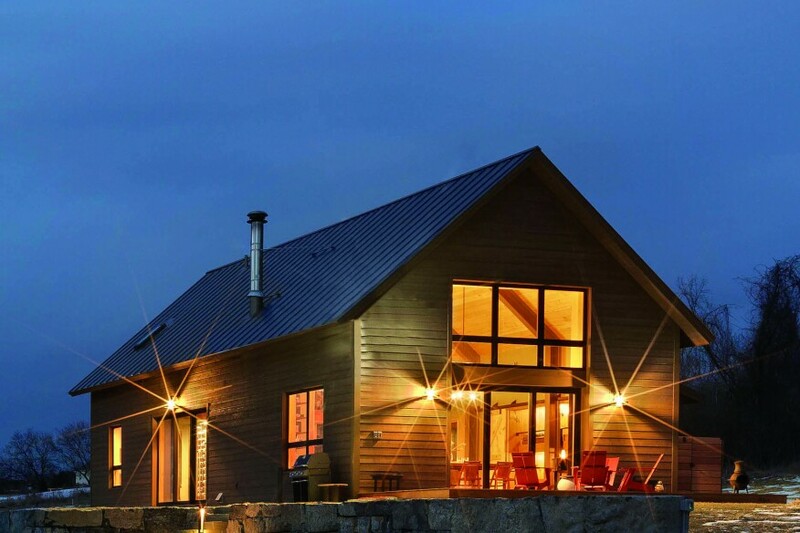 But with a motivated client and a strong vision to connect the inside with outside, Silver Maple Construction and Joan Heaton Architects turned the traditional barn design into a sleek, contemporary home with expansive windows overlooking the Adirondack Mountains. Along with wowing their client, the team’s remodel project won the AIA Vermont Excellence in Architecture Design Merit Award. It’s also the home that garners the most interest from other builders, says Sean Flynn, president of Silver Maple Construction. 1. Steel structure. Using steel beams as the bones of this home accomplished two important characteristics typical to contemporary homes. First, because of its strength, steel allowed the home to achieve massive vaulted spaces without the crossbeams typically required with wooden barn structures. “It immediately gives you the sense of the open space of a barn,” says Flynn. “But it’s much cleaner because there’s none of that timber frame.” Second, Flynn and his team exposed the steel for distinct metal-meets-wood detailing that defines the home throughout. While the finished look is gorgeous, Flynn said it wasn’t easy. Because the steel structure had to be up first, the walls of the home were actually built off-deck and then craned into place.